The MP-1 was another one of those Concept Cars just was just a bit too far ahead of its time and thus sank without a trace. Launched at the Tokyo Motor Show in 1975, the MP-1 was meant to be a Luxury “Multi Purpose” Vehicle - and in concept essentially the Grand Daddy of the countless Taragos (or Estimas) seen on our roads today. Externally, the MP–1 resembles a van with a sharply sloped bonnet. The two front doors are normal hinged doors but the rear–most of the side doors slide backwards along rails. The entire rear of the MP–1 is a top hinged rear door. The passenger side sliding door also incorporated a lifting step to allow wheelchair access. Internally, the front passenger can turn 360 degrees and the rear bench seat can be tipped 90 degrees to face forwards or backwards. A sunroof and refrigerator were included. The original plan was to put the body onto a new FWD platform. But due to time pressures, the body was hoisted onto the platform of a Toyota Crown, complete with its 6-cylinder engine and RWD system. A wasted opportunity. Tomica did a nod to the luxury nature of this car by casting the rear window curtains into the back door. These remotely operated curtains were and are a common feature on Japanese Luxury sedans like the Toyota Crown and Century. So what on earth is this one-off concept doing here in Ambulance trim? Well, the story goes like this: Tomica launched a model of the normal MP-1 as the “97-2" in 1977. That’s the version that Matchthebox was showing. It mustn’t have been a success, as the car did not last in the line-up for very long. It was gone at the latest by 1980, when Tomica reduced their line-up down to 80 models. But when exactly they stopped making this one is unknown. But this scarcity makes for high prices today, and so I never tracked down a Black Box version for under 100 Dollars - which is far too much for my liking. Fast forward to 2007. 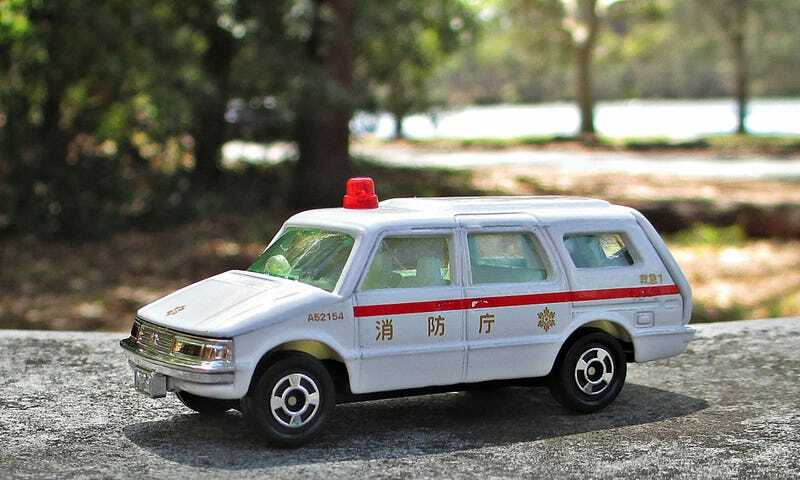 A Japanese chain of Department Stores were offering a line of Special Tomica models - mostly in Emergency Vehicle trim. And for whatever reason, the MP-1 made its first re-appearance then. This time around, they sold in reasonable numbers. I’m guessing a lot of Tomica collectors like me wanted to fill that gap in their collection. As you can see, the casting still looks brand new, there is no sign of wear on the tooling. They really mustn’t have made too many of these. Perhaps the Ambulance trim was a nod to the Tomica Estima Ambulance? I really don’t know - but still, I do hope to find the original release one of these days for a reasonable price. Until then, I will have to console myself with this version.